+ 1 = nine Required Please enter the correct value. Global oil prices diverged yesterday (Tuesday) as market factors both in the U.S. and abroad painted a very distinct picture for energy costs. Options for West Texas Intermediate (WTI) for September delivery fell $2.14 to settle at $104.96 a barrel on the New York Mercantile Exchange. This was the sharpest price drop since June 20. Meanwhile, Brent prices for October delivery rose 0.2%, and ended trading at $110.15 per barrel in London. That means the spread between the two varieties of crude has now reached a new high since July, and marked a reversal of a six-month squeeze in the WTI/Brent oil price spread. Although WTI prices recently approached par with Brent prices, the spread jumped more than 100% Tuesday to $5.04 per barrel. And it will keep rising. In fact, we see it rising anywhere between $8 and $10 by the end of the year. First, to understand how to profit from crude oil prices, investors need to know what prices mean and what drives them. The oil price spread between WTI and Brent crude is a measure of the cost differential between two international prices. 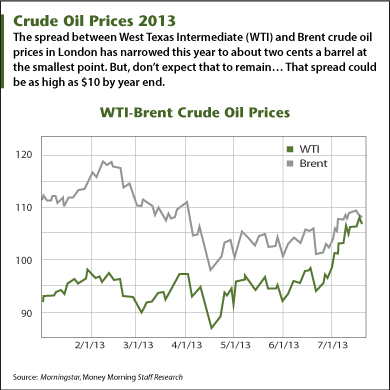 WTI is priced at the NYMEX in New York and is the domestic U.S. price, while traders set the Brent price in London. Despite similarities in quality and sourcing (WTI contains less sulfur and is cheaper to refine), Brent prices had been significantly higher throughout 2012 and most of 2013. The Brent premium to WTI jumped as high as $23 per barrel earlier this year – but rising WTI costs drove this spread to a mere two cents on July 19. The primary source of this spread decline came from increases in WTI oil prices, which have rallied more than 27% from a low of $84.05 a barrel on Nov. 7.